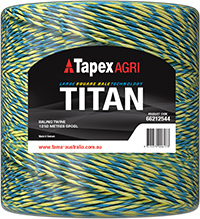 Titan® offers excellent high strength performance and extra length, developed for large square bales of weights up to 750 kg. Ideal to partner with Trojan® Plus. Excellent tensile strength and knot performance. Distinctive Blue / Yellow colour twist. Low friction characteristics for reduced wear on baler parts. Tapex offer guaranteed minimum length in all of their twines.